ChaiVillageLA is part of the rapidly growing Village Movement—we’re not a place; we’re a community led by adults who share their optimism, skills, support, and expertise with each other to joyfully navigate the next steps in our lives. 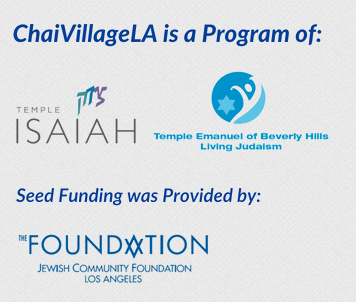 ChaiVillageLA is a collaborative program of Temple Isaiah and Temple Emanuel of Beverly Hills, grounded in Jewish values. Although there are hundreds of Villages around the country, ChaiVillageLA is the first and only synagogue-based Village. Every day, our members come together to create new possibilities for what’s next, providing each other with the programs, resources, and support needed to live lives of purpose and growth. Members tell us that they feel energized by being a part of such a powerful, expansive community. Now over 220 members strong, we are a very active community. We have current events sessions, a short story group, bridge games, walks around the park with a rabbi and trips to local museums and attractions. We’re member-led, so members serve on committees, run classes and events, and help one another with check-in calls, friendly visits, and rides to the doctor. We go out into the community, assisting homeless families, collecting clothing for children in need and assisting after-school programs. How do Members help other members? Would you like to learn more about ChaiVillageLA?